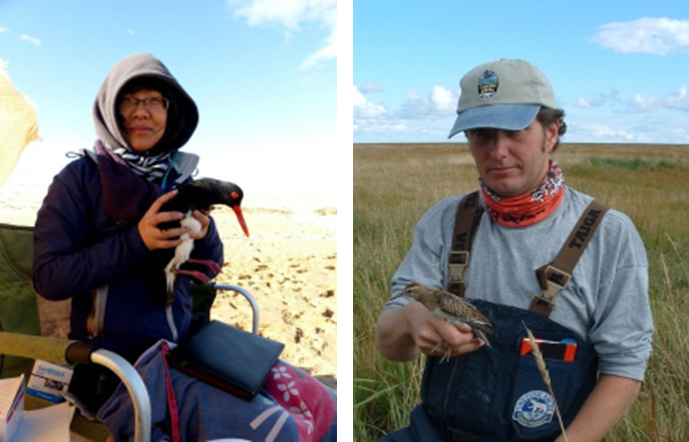 Meijuan Z. and Marcel K.
Authors: Zhao, Meijuan; Cao, Lei; Klaassen, Marcel; Zhang, Yong; Fox, Anthony D.
Brief summary of the paper: Competition may occur when two species with similar feeding ecologies exploit the same limited resources in time and space. In recent years, the Eastern Tundra Bean Goose Anser fabalis serrirostris and Greater White-fronted Goose Anser albifrons frontalis have increased in wintering numbers at Shengjin Lake, China. To examine the potential for coexistence and possible avoidance strategies, we studied (1) their habitat use, (2) foraging behaviours and (3) diets of birds foraging in mixed- and single-species flocks. Both species extensively exploited sedge meadows, where they showed considerable overlap in spatial distribution and diet. The percentage feeding time and diet of both species were unaffected by the presence of the other. Greater White-fronted Geese appeared diurnal sedge meadow specialists, almost never feeding in other habitats. Eastern Tundra Bean Geese were less selective, exploiting other habitats, which they increasingly exploited at night in mid-winter. The use of alternative habitats and night feeding may have avoided interspecific competition. While the specialised feeding ecology of Greater White-fronted Geese may make them particularly vulnerable to loss of sedge meadow habitat, Eastern Tundra Bean Geese may be able to adjust because of their use of alternative habitats and a less restricted diet.